We’re pretty sure that whoever came up with the phrase “business as usual” probably never owned their own business. Business is always changing. These days, the speed of change is crazy fast. 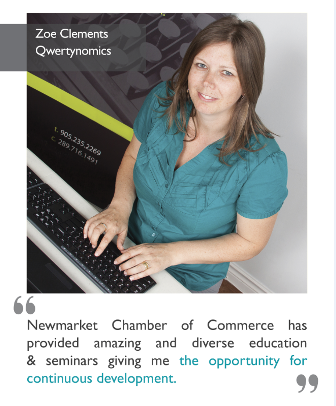 The Newmarket Chamber of Commerce is here to help. We’ve got a wealth of learning opportunities to keep you up-to-date, up-to-speed, and armed with the info you need to help your business thrive. What are the current issues impacting business? What’s being done? Count on us to keep you posted and involved. As the voice of business in Newmarket we advocate on behalf of our members at local, provincial and federal levels. Along with regular seminars and programs, the Chamber works closely with our members to identify key topics of interest to the business community. We facilitate workshops, information sessions and guest speakers to bring insight, knowledge, and strategies to our membership. Busy schedule? Let the education come to you. Available through the Newmarket Public Library, you can choose from a wide range of online instructor-led courses, all free to Newmarket Chamber of Commerce members. Upgrade your accounting skills or check out web design—there are numerous certificate courses to choose from and new sessions start monthly. Imagine having your own team of all-stars in your corner helping you find the right path for your business? That’s the idea behind PeerGroups. PeerGroups brings a selection of complementary businesses together to form a powerful advisory and networking group. Stay up-to-date and in touch via Your Business magazine, the quarterly printed publication of the Newmarket Chamber of Commerce. Every issue features compelling articles, local focus and tips and tools improve everyday work. In addition to ongoing learning opportunities, we also offer a number of workshops and seminars throughout the year. Check our calendar for upcoming opportunities and events.